further stimulus before the $800 billion stimulus bill they’d just passed began spending out. The smart version of this criticism has always focused on October 2009, when Democrats had a filibuster-proof majority in the Senate and there were some early warning signs that the economy might be faltering. But Ezra is right. 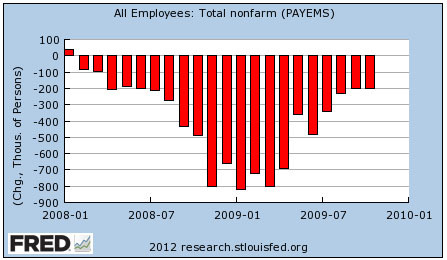 Take a look at the chart on the right, which shows new employment figures through October 2009. It shows steady improvement. At the moment in time when Obama supposedly should have been pressing for more stimulus, our primary sign of economic health was looking pretty good. And it would continue to look pretty good for the next six months. It wasn’t until the second half of 2010 that employment growth started to falter. So what are the odds that Congress would have passed a second stimulus in the fall of 2009? About zero, I’d say. Using reconciliation, which would have allowed a stimulus bill to pass the Senate with 50 votes, was off the table because the Senate had previously decided to approve budget reconciliation instructions that included only healthcare and education. This means that a new stimulus bill would have required every single Democratic vote to pass, and that just wasn’t in the cards. The awkward truth is that Obama simply didn’t lose anything by spending time on healthcare during the summer and fall of 2009. A better criticism is a simpler one: the original stimulus was too small. But even here, the problem is raw numbers. Obama needed a couple of Republican votes to win passage in the Senate, and one of those votes, Olympia Snowe, had already demanded reductions in return for her support. There was no feasible way to pass a bigger package. But is there an even better criticism to be made? I think there is. Although Obama didn’t have the leverage to get more stimulus spending even if he’d wanted it, he could have done more on the housing front. A full-court press on cramdown would have been a good start, and serious pressure on Fannie Mae and Freddie Mac to support principal reductions would have made a difference too. This, I think, is easily the biggest mistake the Obama administration made during 2009. Focusing some serious attention on debt overhang, especially in the key areas of California and Florida, was quite feasible and would probably have made a noticeable difference in keeping the recovery on a stronger track. But even here, this was a plain and simple mistake, not something that slipped through the cracks because they were spending too much time on healthcare. Tim Geithner just didn’t like the idea of pressing harder on the mortgage relief front, and Obama went along. Healthcare reform had nothing to do with it.